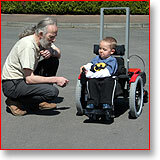 Since its launch in September 2004, we have been happy to bring a dragonmobility powerchair to show you anywhere in Great Britain. Visits can be arranged for an individual user, for individual professionals or professional groups, or any other organisations with an interest in powered mobility. If you are a wheelchair-user, the object will be for you to try a SnapDragon or Dragon for yourself. We can come to your home, school, workplace, wheelchair clinic or therapy department - anywhere you like. We will discuss your needs with you by phone before our visit, and assess your requirements from the information you give us, so that the chair can be as well tailored for you as possible when we come, both in seating and controls. At the time of the demonstration, it will help us to meet any specialist advisor who knows you, and whose expertise you rely on. We will then assess your requirements in more detail, and provide you with a proposed specification and an estimate of the cost. If you want to see and try one of our powerchairs, please contact us on 01223 464460 or by completing and sending our contact form.